Op 9 juli gaf VIW haar vertegenwoordigers het etiket van volksdiplomaat. En dat zijn ze ook, onze uitgeweken Vlamingen, elke dag, waar ook ter wereld en dit zonder memo’s of intentieverklaringen. Zij dragen Vlaanderen uit zonder veel omhaal. Volksdiplomatie gaat gepaard met een omhelzing, een handdruk of een joviaal gesprek. Volksdiplomaten brengen een beeld van ons land als een open, breeddenkend en verdraagzaam land, een land dat niet in zichzelf opgesloten is en niet verkrampt in volksegoïsme of zelfbeklag. Dit is een volk om fier op te zijn. Het was een verademing om te zien hoe Vlamingen zich in het buitenland ontwikkelen en profileren. I decided to insert a new page 'personals' in the blog. The page will display a list of small personal advertisements \ ads 'for rent' - 'for sale' - 'job offer' or whatever. The ads will be inserted in the blog free of charge. Terms and conditions will follow later. Ik heb besloten om een nieuwe pagina 'personals' toe te voegen aan het blog. De pagina zal een list geven van alle advertenties 'te koop' - 'te huur' - 'gezocht' enzovoort. De advertenties zullen in het blog gevoegd worden zonder kosten. Voorwaarden volgen later. 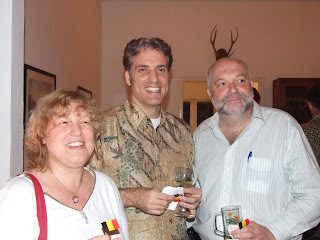 On Friday July 22nd, 2011 - and not on Thursday July 21st as it should have been to be "following the rules of the book and official etiquette" - the Belgian community in Jakarta (and wide surroundings) gathered for a small party, celebrating the Belgian National Day. Ophelie and Arnaud Lion were our considerate hosts and kindly shared their home and hospitality with the community. After a short speech by Arnaud Lion - counselor at the Belgian Embassy (left on the picture) - Ambassador Tanghe (right on the picture) and our all Randolph Wintgens (president of BLIC), everybody enjoyed some small fingerfood, a big "Belgian tricolore" cake (next to Belgian waffles and 'Dame Blanche' ice cream ! ), some drinks and snacks. Some new faces showed and were welcomed : Aaron Russell (and family) and Jean-MarcVermeulen (and family) intend be amongst us for the next few years. We hope they have a pleasant and enriching stay in this beautiful country. The atmosphere was cordial, no-nonsense "Belgian style". Flemish, French, English and some Bahasa Indonesia filled the air, mixing into "Bahasa Jakarta". All are looking forward towards the November 15th "Kings' Day" celebration. The pics you can find in the Photo Gallery. The Ambassador presented Indonesia's vast potentials in investment and trade sectors before Belgium's business leaders at a seminar on investment and trade that was hosted by Flanders Investment and Trade, Brussels, 8 June 2011. Embassy of Belgium, Economic & Commercial Attaché for Flanders, Brussels and Wallonia in Jakarta is recruiting a Commercial Assistant. The main task is to assist Belgian companies wanting to export goods and services to Indonesia. 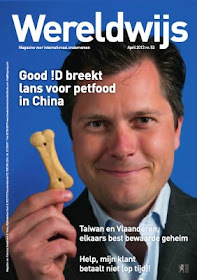 More information is available on www.flandersinvestmentandtrade.com. Op 22 september organiseert Voka Kempen de kick-off sessie van Intense Indonesia. Met dit 1-jarig project brengen we samen met u uw kansen in dit Zuid-Oost Aziatisch land in beeld. Rest ons nog jullie, de blogvolgers, te bedanken voor de vele bemoedigende reacties, die wij op deze blog, per mail en per sms mochten ontvangen. Aangezien Bimesa tal van missies en projecten uitvoert en ondersteunt, zullen jullie in de toekomst nog van ons horen. Dank vooral aan iedereen die het project in Bajawa tot een memorabel succes maakten. Ook een dikke merci aan de ploeg van Vlaanderen Vakantieland, aan Thomas Vanderveken, die een linkje voorziet op hun webpagina. Our dear Belgian friends have left the Island of Flores and are on the way to Yogjakarta. Do not hesitate to visit their blog and / or subscribe to the RSS-Messages Feed / RSS Reactions Feed to keep updated on their adventures, encounters, difficulties and successes. Dr. Noel B. Salazar is visiting Indonesia in order to conduct an international research related to migration and tourism of Belgian people who are living and working in Indonesia. The research is supported by the Vlaams Fonds voor Wetenschappelijk Onderzoek (1.2.210.09.N.00) and the Directoraat-generaal Onderzoek vand e Europese Commissie (PIRG03-GA-2008-230892). 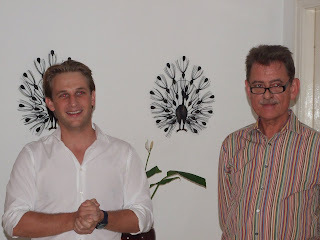 The very erudite Dr Salazar (left on the picture) had an interesting and revealing meeting yesterday Monday July 4th with Arnaud Lion (counselor at the Belgian Embassy in Indonesia- right on the picture) at the Belgian Diplomatic Mission . What are the reasons for Belgians to settle down in Indonesia, how long do they usually stay, what is their profile, what are their problems, are they successful integrating and making business. To-the-point questions that showed academic and human insight from the Doctor that were addressed in a knowledgeable and open way by Arnaud Lion, who proved to be well versed in not only managing the bureaucratic hurdles, but also in assisting the 'in-the-field' experiences, challenges and problems of the Belgian citizens in Indonesia. The overall picture being positive and mostly leading to 'long stayers', it is clear that both Indonesian and Belgian people and authorities are - notwithstanding some administrative barriers - able to 'speak the same language' and develop a beneficial and durable cooperation. Dr Salazar still has some time for interviews with Belgian people living in Indonesia (or Indonesian people that are able to look back on a Belgian experience) that are willing to share insights and observations. All our little bits of information will help him draw the 'big picture' of what most certainly will be a remarkable report. Dr Salazar will also visit Yogjakarta and Bali. Would you be able to spare the time, then do not hesitate to get in contact with him or with the webmaster. An interesting, challenging talk / interview will be your reward. Contact details in the original posting or through the contact page of the blog. For the pics also visit the photo gallery. As of 1st September, 2011, all applications for Schengen visas will be handled by the Netherlands Embassy. 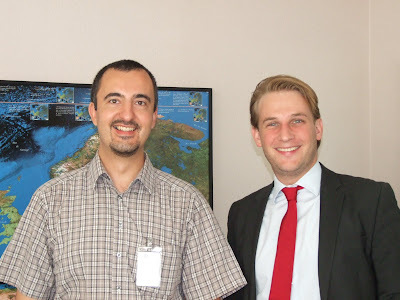 Last date of application at the Embassy of Belgium : Thu 11 August, 2011. SOCIAL - BIMESA - the team ! For the news feed of the BIMESA blog see on the right bar or go to their website ! Almost 37,000 people took the University of Indonesia (UI)’s Simak entrance test in cities as far away as Europe on Sunday in hopes of attending one of the nation's best colleges. I have decided to put the BIMESA newsfeed on the blog, so you can follow all "live" so to speak and go read on the blog itself whenever interested. The original post on this initiative you can access here. Binnen twee weken beginnen de scholen opnieuw in Bali. Onze sponsorkinderen hebben het vorig schooljaar erg goed gedaan en de meesten hebben betere resultaten behaald. Voor 22 kinderen zoek we een sponsor. Met uw bijdrage van 20 Euro/maand kan U een positieve wending geven aan de toekomst van een kind. Of steun ons educatief fonds,dit komt al de sponsorkinderen ten goede. In ons project Lovina hebben we een vervoersprobleem. Onze SMU-sponsorkinderen (hoger middelbaar) geraken niet op school. Er is vanuit het dorp Tegallinggah geen vervoer (bemo) meer naar de scholen in Singaraja. Onze coordinator ter plaatse tracht momenteel een (erg dure) overeenkomst te sluiten om toch een bemo naar Tegallinggah te krijgen, maar het wordt twijfelachtig of zij succes zal hebben. Voor slechts 5000 Euro kan CIMD zelf in vervoer voorzien.